Don't know what to get? Give them a Tactical Tailor Online Gift Certificate. Available in denominations of 25, 50, 100, 250 and 500 dollars. Perfect for soldiers, police officers, airsofters, or anyone else that might have a need for high quality tactical gear. After purchasing a Tactical Tailor Gift Certificate, your Gift Certificate Code (starting with the letters 'GC') will be supplied to you in your order confirmation email and/or you will receive a separate email with the code in it.Simply send the gift certificate code to the lucky recipient to use with his or her next order with us. All they have to do is enter the code at checkout and the amount will be subtracted from their order. Gift Certificates are redeemable only for items in our ONLINE STORE and not redeemable for cash. 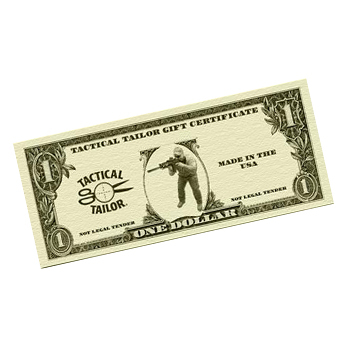 Tactical Tailor Gift Certificates are not for use at our physical store or any dealer locations. Tactical Tailor does not ship a physical gift certificate. It is up to the buyer to supply the gift certificate code to the recipient. Be sure that the email address you supply with your order is correct. Incorrect email addresses will prevent the gift certificate code from reaching you and we will be unable to contact you. Tactical Tailor cannot be held responsible for lost or stolen gift certificate code numbers. Your gift certificate code will be provided in an email sent automatically after your order is confirmed. If you do not receive your code within 48 hours, please contact us.